Easter is on March 31st this year and to celebrate we have a nice collection of Easter dogs for your appetite. The dog portrait below is an excellent example of a creepy Easter dog portrait - don't you think? In the mix of weird we also have some normal pictures of dogs dressed up as the Easter bunny with bunny ears, Easter baskets with eggs, and other various Easter holiday accessories. It's funny how these dogs might not even realize how scary these human Easter Bunny costumes actually are! Oh the extent at which our pets put up with us by letting us dress them up and take pictures for the whole world to see on the internet. The big dog below looks more willing than any of the other dog portrait participants with the creepy looking Easter Bunny character. As a matter of fact this long legged pooch is pretty proud of his fluffy pink bunny ears!!!! 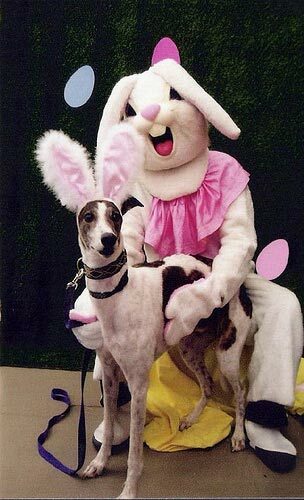 Now that we have posted a few odd looking dog portraits with the Easter Bunny, let's move on to some regular Easter dogs without any creepy human in the pics. See the complete collection at our pinterest board Easter Pets - click here. The amazing thing is that while we are so internet obsessed, while we have disconnected from the real world so much, we marvel more at movies and hi-tech gadgets rather than the real world that dogs can get us connected with.